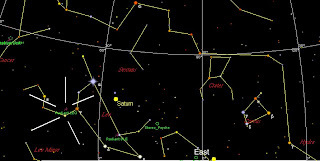 The December Southern Skywatch is now up. 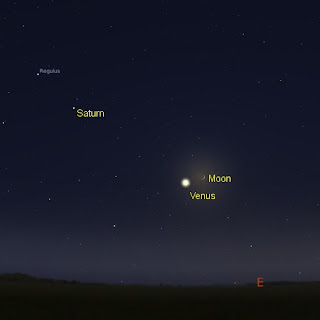 This month we have Venus near the Moon, the Opposition of Mars and the Geminid meteor shower. Comet Holmes is still around too. Enjoy! This is interesting. It is a video about a science exhibit in the virtual world Second Life. The 20 stars and/or star systems nearest to the Earth are shown in this exhibit (28 Mb). 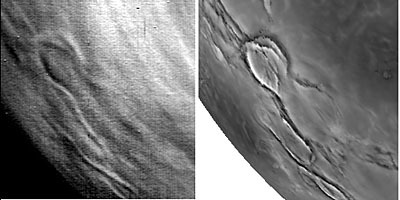 The prestigious journal Nature has made the first published science results from Venus Express available free of charge. The full Focus issue is here, try starting with the News Feature, then Venus dispatches, before going on to the more meaty bits. There is also the Nature podcast, with an interview on the Venus Express results. You have to see this, a web cam watching Mount St. Helens. Over the past few nights the volcanocam caught the mountain illuminated by the Moon. 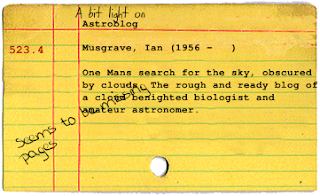 From the catalogue card generator. We forget, in this modern age, how much we rely on artificial lighting, and conversely, how much our ancestors relied on the Moon. This was bought home during a performance of "Second to None", an astounding musical and dance celebration of the Aboriginal and maritime history of Port Adelaide. The performance involved being bussed to several important sites of Port Adelaide history, including Harts Mill, Glanville Hall and the Snake Pit. Many of the venues had limited lighting, like kerosene lanterns at Glanville Hall, or the fires at the Snake Pit. In the twilight at Glanville Hall, the kerosene lanterns were enough to illuminate the dancers. As we left the venue, the full Moon rose, a gorgeous sight on the horizon. We then went to the Snake Pit, a hollow in the dunes of significance to the Kaurna people to witness more dancing. To enter this area, we were welcomed in by a projected face of an aboriginal Elder. 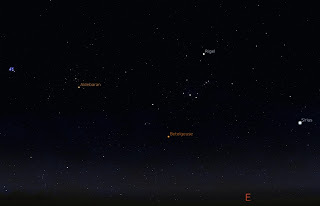 Behind the projection, Orion, seen as a group of celestial hunters by the Karuna, was rising. As part of the performance in the hollow was a group of hunters going after game, the significance of the projected elder backed by Orion was something special to me, and made the performance even more haunting to me. While most of the illumination for the traditional dance was firelight, the bright Moon made it easy to see the performers without more traditional lighting. You can understand why before electric and gas lighting, people used to live their life by the rhythms of the Moon, and major festival were held on the night of the full Moon. Even with fires and burning brands, it is hard to see without the light of the Moon. And the light of the Moon has a whole other quality about it compared to artifical light. Under the Moon it's a different world out there. dunes, on the other, the Karuna shield fire sculpture, lighting up the beach. Natural and artificial lighting up a timeless landscape. Glabrous gla·brous –adjective Zoology, Botany. having a surface devoid of hair or pubescence. I .. 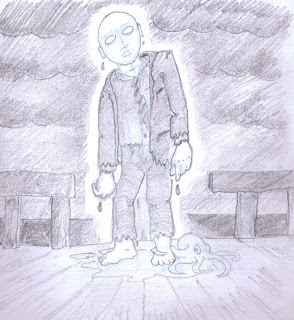 I can't tell you why, but I had to draw this to exorcise an image in my mind. Imagine the figure saying "Are you my Mummy?" I .. I still think I have to move to Alice Springs, as far away from the ocean as possible. The 30th Carnival of Space is up. 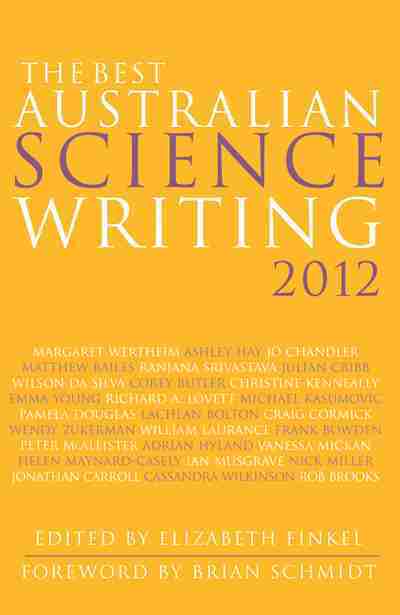 The 30th Carnival of Space is up at the Bad Astronomers. Lots of space images, images from the Rosetta flyby, Bussard ramjets, and lots, lots more. Pop over and have a look. While we have been awed by comet 17/P Holmes, Comet F1 LONEOS has been quietly achieving some nice things. It stared back weeks ago, just after Holmes burst into view. LONEOS was passing by Antares, and Michael Mattiazzo snapped this great shot, (with Antares and a globular cluster in the field, see Mikes web site for some more great comet shots). Then between October 29-32 a coronal mass ejection hit the comet. You can see the comet outburst in Comet Al's false colour image (see his Gallery for more great shots) generated from STEREO satellite images, and he also made a great animation of it as the CMA passed. LONEOS has faded now, but it was a gem of a little comet. Comet 17P Homes is Freaking Amazing! Check out this image and see if you don't agree with me. It's pretty big, and takes some time to download, but it is worth it. Mouse over the titles to see the comet develop. If you want to cut straight to the composite, go here. 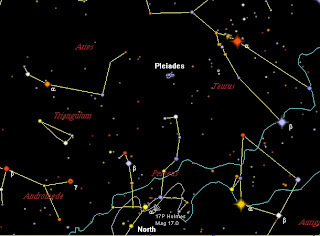 Comet 17P/Holmes is fading now, and binoculars are becoming needed to see it (I can't see it now even with binoculars, but it is right close to the horizon anyway). However, comet holmes has just encountered Mirfak, alpha Persii, and this is making for some astounding images. See this stunning image from Martin Gembec, this one and this one as well from Danilo Pivato, and this very nice one from Ronaldo Ligustri. 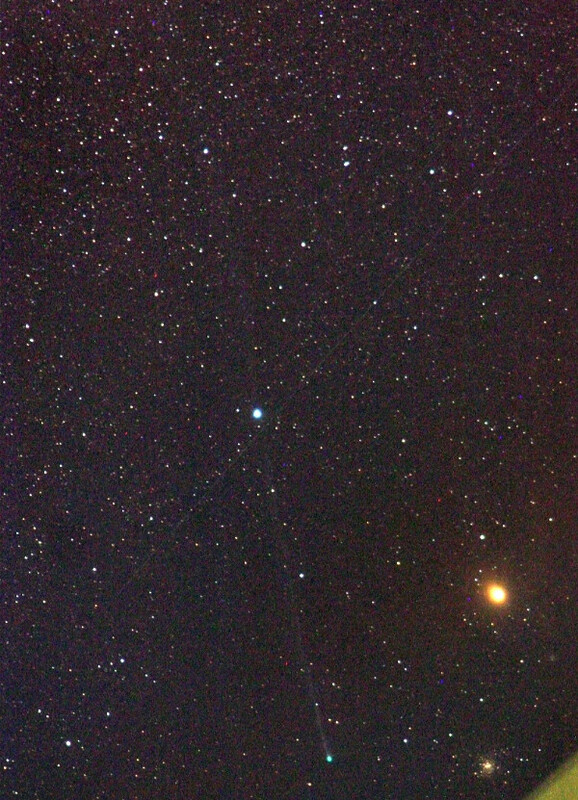 UPDATE: Have a look at Tom's images, with a meteor streaking through comet Holmes! I haven't been as diligent in updating over the past few weeks, even with the exciting comet Holmes around. I've had some really persistent viral thing, Sky&Space deadlines and el mucho exam marking to do. So I forgot to mention the occultation of Neptune. Heck I forgot it myself. On the day I spent a large chunk of it sitting in a doctors waiting room, only to find that although I feel like death warmed up, there appears to be nothing wrong with me. Then in the evening Chez Reynella headed of to be part of the Port Adelaide Twilight Christmas Parade. We formed part of the contingent walking with SmalestOnes kindergarten. We all wore elf hats or reindeer ears as part of the Christmas Spirit, and handed out small containers of bubble mix to the crowds. So the parade was accompanied by a cloud of rainbow bubbles. Again, like Halloween, Christmas doesn't quite work in Australia. It's hard to conjure up images of snow when at 8:00 pm in the evening it is quite bright and around 30 degrees C .
Still, the kids had fun, Santa Claus arrived in a sleigh pulled by a red FJ Holden. Then we hung out at the street festival, listened to kids bands and danced to Jungle Jooce (a sort of 70's -80's cover band, I think). SmallestOne even tried some break dancing (not entirely intentionally, I think). Then we watched the fireworks and went home with a car full of tired pumpkins. And so I fell asleep, completely forgetting about the occultation (or finishing my bit for Sky&Space). I don't think I could have stayed up even if I had remembered. Ironically, the skies were beautifully clear. Over Australia, most sites were clouded out, a couple of people saw it though. Oh well, I only have to wait until 2017 for another chance at a Neptune occultation. A view of the north-eastern horizon at 4:00 am AEST on 19 November (similar views will be seen at equivalent times eg Adelaide at 4:00 am ACST). click to enlarge. If getting up for Comet 17P/Holmes, why not hang around to see the Leonids? The Leonid meteor shower occurs in the early morning of Monday, 19 November (actually it's been going for a while but the peak occurs at this time this year). It will not be very exciting as the main peak occurs in daylight as seen from Australia, but we may get as many as 10 meteors an hour around 4:00am. The point of origin of the meteors is roughly in the sickle of Leo, near the bright star Regulus, which will be in the north-east. Saturn will be nearby, and Venus will be rising, so it will make a nice mornings viewing. 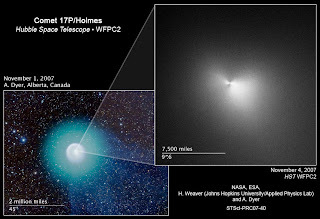 The Hubble Images of comet 17P/Holmes have been released. They look pretty cool, so head on over and have a look. Comet Holmes, while not as beautiful as comet McNaught, is still pretty amazing. Over two weeks since it exploded into view, it is still quite bright, at least magnitude 3! The comet's coma is now bigger than the Sun! The history of comet Holmes is pretty interesting, David Strange recounts this history here. Comet Holmes is getting pretty close to alpha Persii (Mirfak), and may be hard to distinguish with binoculars over the next few days. I've uploaded a new printable PDF spotters map here. Martin Mobberly has some fantastic images of Holmes near Mirfak here and here. 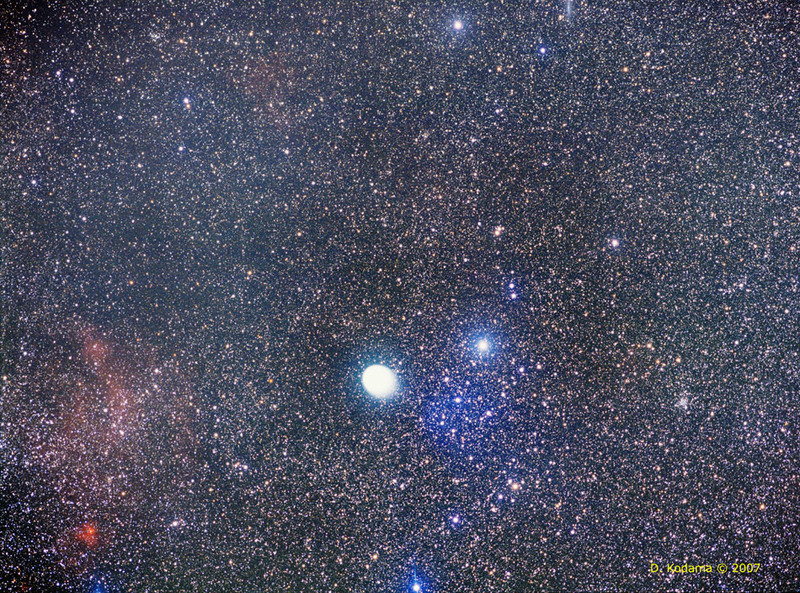 Dave Kodama has a wonderful wide field image, with a very rich starfield. There is another fantastic group of images and an animation here. (yes, i know I use fantastic a lot,but I mean it). Reader TMO has a great series of timelapse movies here. A nice black and white shot is here. 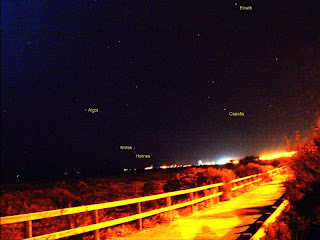 Bob Yen does some fantastic comet blogging from Baja Mexico. More images of the comet can be found at Spaceweather Gallery, and there a whole IceInSpace thread for Australian images. In the bloggosphere, Dirty Skies experiences Comet Madness, DaveP gets to see comet Holmes, Tom sees comet Holmes, Top of the Lawn sees comet Holmes above the street lamps! Comet AL plays with some images and come up trumps! Carnival of Space 29 rides out! The 29th Carnival of Space is at Riding with Robots. Earth as seen form space is a big theme, with the Lunar probe Kaguya and Rosetta sending back some stunning images. There is farside radio telescopes, Lunar Land scams and lots, lots more. So saddle on up on ride on out now. If you want to write submissions for the next Carnival, here are the instructions. I finally saw comet 17P/Holmes. In between cloud and getting another blasted cold I was just missing out on views of the comet. Then I staggered out at 3:00 am and the sky was clear. Grabbing the binoculars and my trusty camera I raced (well waddled slowly, trying to avoid bumping into things in the dark) down the beach. Joy! Happiness! The northern horizon was free from cloud for once. But not sky glow, following the stars of Perseus down showed that the comet was located just above the glow of the harbour. Not the worst glow, over the big cranes, but still non-negligible. The comet was not visible to the unaided eye, but then, Holmes turned out to be only two fingerwidths above the horizon, and even alpha Persii, Mirfak, was difficult to see at magnitude 1.8. But through binoculars, the comet was perfectly visible. It looked like 47 Tucana, a perfect misty sphere. I was entranced. Even though I had the good fortune to see comet McNaught, with its spectacular tail, this little blob, possibly the most unusual comet recently, held my attention. This disk of light exploded from obscurity and is still bright weeks later. Why? A mystery not yet solved. And so my cold came back big time, probably due to standing out in the windy cold watching the comet. 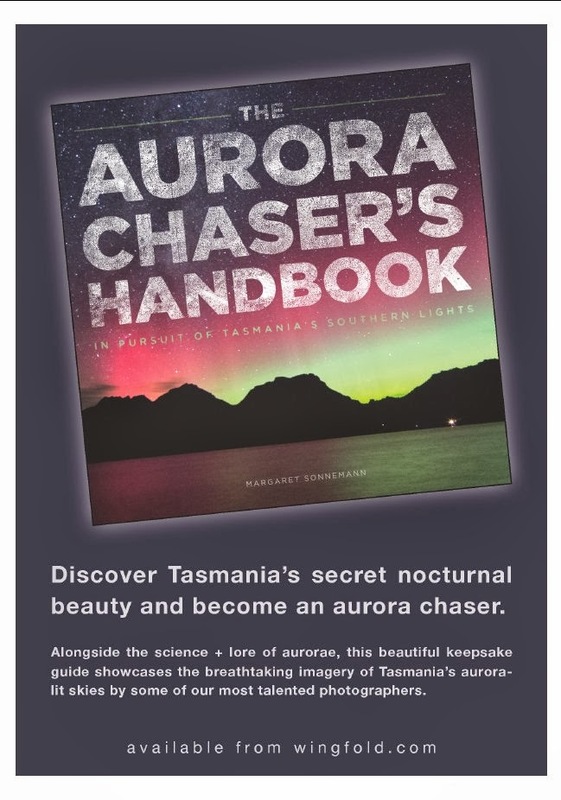 Why do we amateur astronomers do this too ourselves? Are we insane? Most people would say yes, but then these are the people who will get up at 3:00 am to watch peope kick a ball around on a small screen. This is a puzzle, as the eminent entomologyist Mike Majerus remarked, kids will spend hours collecting and memorizing endless lists of Pokemon, and that's normal, kids who memorize moths and butterflies (or dinosaurs), are seen as weird. Why is this? Everyone is beholden to some passion, but those of us who have a passion for the natural world are seen as strange. That is an issue for another post some day, but now, pleased that I can share my experience of comet Holmes, I must take my drugs and go back to bed. Comet 17P Holmes is still bright! At magnitude 2.7, it is still visible to the unaided eye, nots clearly from northern Australia, but even from Adelaide it can still be seen. The chart on the left (click on it to enlarge it) is the comet as seen looking north at 1:30 pm ACST from Adelaide, other places will see similar views at equivalent local times (eg 1:30 pm AEST Sydney and 0:30 am AEST Brisbane). A printable PDF spotters map is here. The further North you live, the higher the comet will be above the horizon, with the best views in Darwin and North QLD. Go out tonight and have a look. It's amazing! I finally got to see Comet LONEOS last night and tonight, in between slabs of cloud. I found it very difficult to see, even in 10x50's, as a faint fuzzy dot. Other observers have seen it quite clearly, with a short tail, but I have to compete with cloud haze and street lights, so it's not surprising that I'm not getting as good a result. Tomorrow night (Monday, Nov 5), the comet will be just off Antares, and should be a very nice sight. Comet Holmes is still bright (and we southern hemisphere types still have to get up at 3:00 am in the morning to see it, see this map). There are some nice Australian shots in the Ice in Space forum. Some great images are coming out of the northern hemisphere too. This is probably the most amazing one. This one is pretty good too. A nice black and white shot here, and scroll down for some nice images here. November Southern Skywatch finally up. After a few FTP problems, the November issue of Southern Sky Watch is now up. Of course we have maps for the comets now gracing our skies, as well as an occultation of Neptune and Mars entering the evening sky. I've written before about how celebrating All Hallows Eve (Halloween) doesn't make sense in Australia. This very there wasn't the same brightness of sky and sea that made a celebration of all things spooky somewhat ironic, due to the clouds that have been stopping me from seeing the various comets about. Still even cloudy the atmosphere was hardly spooky at all. This year we were all a bit less organised due to illness (blasted flu) and work. And the Twins were busy studying for exams. Still, the Bettdeckererschnappender weisle organised lollies for the neighbours to hand out to the kids, MiddleOne dressed as a ghost again, and made a Jack O'Lantern from an apple and a glow stick (worked well too). EldestOne went as a Teenager (that was scary). I was going to do some experiments, like last year, but things didn't work out that way. The cloud meant no comet LONEOS, or other astronomical phenomenon to show the kids when it did get dark, but the sugar charged kids would probably not have paid attention anyway. Everyone had fun though, and that was the main thing.